USD/CNY is currently trading around 6.8430 marks. It made intraday high at 6.8546 and low at 6.8319 levels. A sustained close above 6.8545 marks will test key resistances at 6.8775, 6.8938, 6.9290, 6.9414, 6.9590 and 6.9726 marks respectively. Alternatively, a daily close below 6.8545 will drag the parity down towards key supports at 6.8300, 6.8198 and 6.8037 marks respectively. 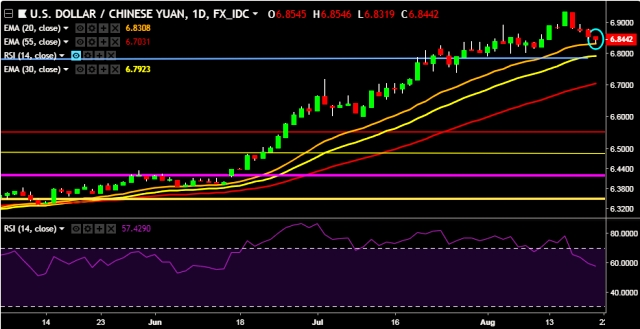 PBOC sets yuan mid-point at 6.8360 / dlr vs last close 6.8640. We prefer to take short position on USD/CNY only below 6.8300, stop loss at 6.8550 and target of 6.8198/6.8112.